English ivy is a tough and hardy plant that some people don’t want anything to do with because it often “takes over” in the landscape once it gains a foothold. However, when ivy is properly planted and tended, it is an attractive evergreen plant that tolerates sun, shade, drought, and poor soil conditions. For these reasons, it is sometimes planted in the home landscape as a ground cover in areas that are difficult to access for mowing or maintenance. Just be aware that the ivy knows no bounds as a running and invasive plant, and be prepared to deal with controlling your plants within the desired areas. A better use for ivy, I think, is as a container plant confined to window boxes or in pots that can be located indoors where your ivy will thrive and provide nice greenery in household areas that might receive little or no sunlight—like the recreation room in your basement. Having said all that—our purpose on this page is to tell you how quickly and easily you can start new ivy plants from cuttings should you decide that you do indeed want to capitalize on the positive aspects of this low maintenance evergreen plant. Use your garden snips to take several cuttings from existing ivy plants in your landscape or in the landscape of a gardening friend. 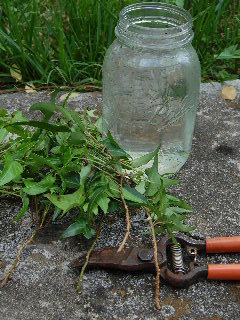 I recommend taking cuttings that are at least 6 to 8 inches in length. Be sure your cuttings include at least one or more nodes (areas where leaves emerge from the stems), as these are the places from which new roots will develop on your cuttings. Strip off the leaves near the ends you have just cut, and dip the ends of the cuttings into a bit of Rootone® rooting compound before inserting the cuttings into holes you have established (with a pencil or a small stick) in a container of suitable starting medium such as wet sand, perlite, or other loose and moist growing medium. Gently pack the soil around the inserted cuttings so that each cutting is held firmly in the mixture. Keep the soil evenly moist (but not soaking) and in a semi-shaded area, and the new cuttings should develop sufficient roots to transfer the cuttings to permanent pots in about 3 to 5 weeks. 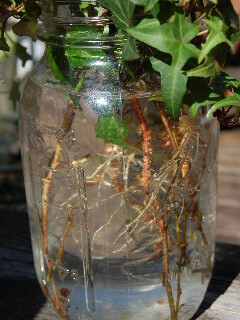 An even easier way to get roots started on your cuttings is to simply place them in a clear jar filled with water. Position the container in a sunny location, and watch as the roots develop. Again, the root development should be sufficient to permit potting within just a few weeks.